Home Shows Welcome New Bass Player Matt Paetsch! Join us tonight at Skully’s at 9PM to welcome our new bass player! Matt Paetsch was born in Cleveland, Ohio. He started playing piano at 6 years old, the bass guitar and guitar at age 12, and double bass at 18. In 1996 Matt relocated to Columbus, Ohio where he attended The Ohio State University earning a degree in bass performance with a focus on jazz studies in 2001. While there Matt was a winner of the Eugene C DeAngelo scholarship for bassists. Since then Matt has been a staple of the Columbus music scene performing a wide variety of genres of music with many different bands, orchestras, and musicals in central Ohio, and has toured nationally with various acts. Matt won an award for best musical direction from the Ohio Theatrical Society for his direction of Red Herring Theatre Ensembles production of Jason Robert Brown’s “The Last Five Years” in 2006. 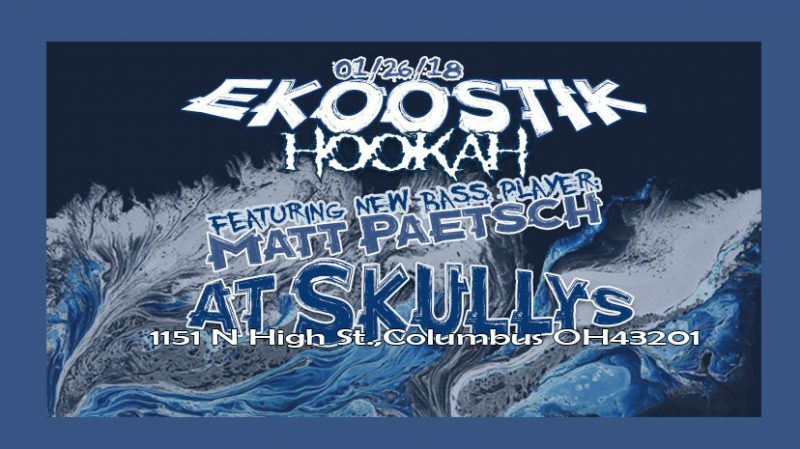 Currently Matt can be seen with Ekoostik Hookah, the Columbus Gay Men’s Chorus, the Wally Mitchel Jazztet, Jen Miller and the Flytown Band, the Ransome Band, Matt Adams, and every Sunday morning with the St. John’s Exalt Team. Matt Paetsch is also a music educator. Matt has taught double bass, bass guitar, guitar and piano privately since 1998. Matt has taught double bass, bass guitar, and guitar at Kenyon College where he has been adjunct faculty since 2002. Matt was also the owner of the Cliftonville Music Academy from 2010 – 2013. Address: 1151 N High St.